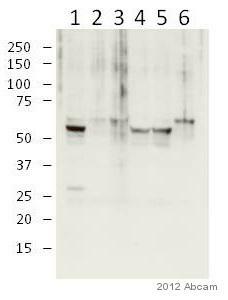 Full length native protein (purified) corresponding to Human pan Cytokeratin. Our Abpromise guarantee covers the use of ab6401 in the following tested applications. Use 10µl for 5 x 107 cells. Cytokeratins, a group comprising at least 29 different proteins, are characteristic of epithelial and trichocytic cells. Cytokeratins 1, 4, 5, 6, and 8 are members of the type II neutral to basic subfamily. Monoclonal anti cytokeratins are specific markers of epithelial cell differentiation and have been widely used as tools in tumor identification and classification. Monoclonal Anti Pan Cytokeratin (mixture) is a broadly reactive reagent, which recognizes epitopes present in most human epithelial tissues. It facilitates typing of normal, metaplastic and neoplastic cells. Synergy between the various components results in staining amplification. This enables identification of cells, which would otherwise be stained only marginally. The mixture may aid in the discrimination of carcinomas and nonepithelial tumors such as sarcomas, lymphomas and neural tumors. It is also useful in detecting micrometastases in lymph nodes, bone marrow and other tissues and for determining the origin of poorly differentiated tumors. There are two types of cytokeratins the acidic type I cytokeratins and the basic or neutral type II cytokeratins. Cytokeratins are usually found in pairs comprising a type I cytokeratin and a type II cytokeratin. Usually the type II cytokeratins are 8kD larger than their type I counterparts. 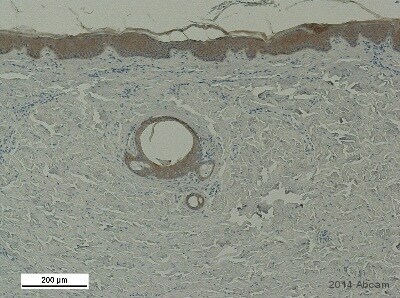 ab6401 staining pan Cytokeratin in Mouse liver tumor tissue sections by IHC-P (Paraformaldehyde fixed paraffin embedded sections). 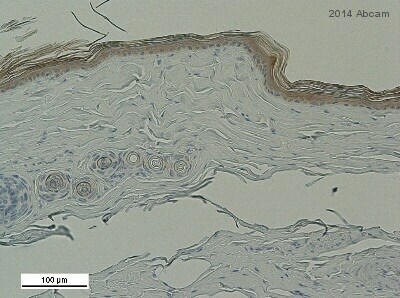 Tissue was fixed with paraformaldehyde and blocked with maleate buffer blocking solution for 30 minutes and 22°C. Antigen retrieval was by heat mediation in citrate buffer. Samples were incubated with primary antibody (1/500) in maleate buffer blocking solution for 16 hours at 22°C. An undiluted biotin-conjugated Donkey polyclonal to mouse IgG was used as secondary antibody. 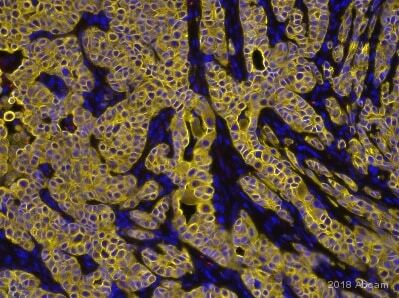 ab6401 staining pan Cytokeratin in Human Panc1 cells by ICC/IF (Immunocytochemistry/immunofluorescence). Cells were fixed with acetone/methanol (1:1) and blocked with 1% BSA for 1 hour at room temperature. Samples were incubated with primary antibody (1/300 in PBS) for 2 hours. An Alexa Fluor®488-conjugated DGoat anti-mouse IgG polyclonal (1/1000) was used as the secondary antibody. Nuclei were counterstained with DAPI. ab6401 staining pan Cytokeratin in mouse pancreatic ductal adenocarcinoma (left-hand panel) and mouse pancreatic neoplasia (right-hand panel) sections by immunohistochemistry (IHC-P - paraformaldehyde-fixed, paraffin-embedded sections). Tissue samples were fixed with paraformaldehyde and blocked with 10% serum for 1 hour at room temperature; heat mediated antigen retrieval was performed. The sample was incubated with primary antibody (1/250) at 4°C for 8 hours. A Biotin-conjugated Goat polyclonal (1/1000) was used as the secondary antibody. 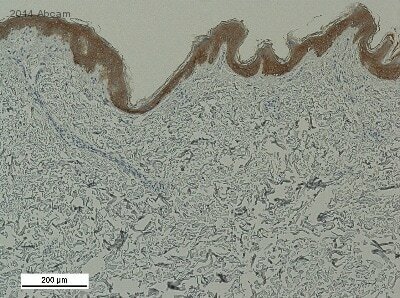 ab6401 staining pan Cytokeratin in Mouse pancreatic neoplasia tissue sections by Immunohistochemistry (IHC-Fr - frozen sections). Tissue was fixed with paraformaldehyde and blocked with 1% BSA for 1 hour at room temperature. Samples were incubated with primary antibody (1/250 in PBS) for 8 hours at 4°C. An Alexa Fluor®488-conjugated goat anti-mouse IgG polyclonal (1/1000) was used as the secondary antibody. Publishing research using ab6401? Please let us know so that we can cite the reference in this datasheet. I need specification (data) sheets, with specific protein concentrations per lot#, for various products that I used by Abcam. This information must be include in my file to be archived at work. ab16667 - Lot# GR59808-2 ab6401 - Lot# GR1281-5 I found generic data sheets online but I need the documented protein concentration for the actual lot numbers I used. Somebody misplaced the original paperwork that came with the products. Attached are the two Certificates of Compliance you have requested. I would like to ask you for anti-pan Cytokeratin antibody product: What is the different between anti-pan cytokeratin antibody(PCK-26) code # ab6401 and anti-pan cytokeratin antibody (PCK-26) code # ab11214. ?. I also would like to know more information for your product, anti-pan Cytokeratin antibody (AE1+AE3) prediluted code # ab961. Thank you. The antibodies ab6401 and ab11214 are from the same clone [PCK-26], so they are the same antibody with similar binding characteristics. The difference is that ab6401 is not purified and is not conjugated while ab11214 is purified and conjugated to FITC. The mouse monoclonal [AE1+AE3] to pan Cytokeratin, prediluted, ab961 is already diluted and ready to use for cell and tissue staining right out of the vial. You receive 6 ml of this pre-diluted antibody. Our customer has bought 2 antibodies ab6401 and ab1416. He wants to know whether these two antibodies can be expressed by Epidermal Keratinocytes (as they are epithelial cells as well) or no? The other question is what is the antibody that we can use which is not expressed by epithelial cells (Epidermal Keratinocytes)? If your customer is interested in using an antibody to differentiate between these cells and other epithelial cells I would suggest that they do a review of the literature to see which markers have been used in their field of research for these purposes. If they have a particular target they are interested in please do let me know and I will see if I can suggest a suitable antibody. I hope this information has been of help. If you require any further information, please do not hesitate to contact us again.